For a foundation addict like me, one of the glorious moments in my (window) shopping escapades would be finding an affordable foundation that matches my skin tone perfectly. It was as if the universe conspired when it lead me to find this foundation in the midst of the buzzling megamall department store (the place where I will probably be after a day's work if I am not in the gym). I was not planning to buy a new foundation but when I saw this bottle at the Maybelline Counter, I can't help but swatch it. There were like 5-7 shades available and just looking at the bottle, I knew I would find my perfect shade. I immediately swatched B2 at the back of my hand. It appeared a notch lighter than skin color and has strong yellow undertones. I immediately knew B2 was my perfect shade. Yes, I still swatch foundations at the back of my hand but the shade must appear lighter than my skin color and must have yellow tones. This technique is pretty accurate for me but when I have doubts on the foundation color, I do swatch it on my neck not on my chin. The reason being is that my face is already loaded with foundation and as such perhaps almost all foundations whether or dark would probably blend well with my (fake) skin. The product comes in a glass pump bottle which reminded me of the L'oreal True Match Foundation. This contains SPF 24 PA++ and costs 499 pesos only. I find this foundation very affordable because it has a good amount of product. According to Maybelline, this is a liquid mousse foundation. It promises to deliver an airbrush finish. I bought this on a whim because I found my perfect shade in B2. If you are NC30, this shade is perfect for you. I was pretty amazed on the pigmentation, coverage and consistency of this foundation. As mentioned by Maybelline this is a liquid mousse foundation, thus, I find the texture and consistency of this product very unique. It is sui generis. It has a light air whipped texture but blends beautifully like a cream product. It goes one smoothly on the skin. I prefer applying it with my fingers. The warmth of my fingers makes the product melt on my skin. It gives off a satin finish which looks very photogenic. The coverage of awesome. It can cover my redness and rashes. Also, it evens out my skintone very nicely. I usually apply two layers for better coverage and surprisingly, this does not look cakey at all despite its thick formula. I still set this with a powder foundation to keep the foundation in place. This does not highlight my dry areas. Since this foundation has a mousse like consistency, I discovered that it works very well on a mattified/dry area. On my first try of this product, I was not impressed at all because it looked streaky, patchy and uneven. Later on, I realized that this does not go well with a heavy moisturizer like my Physiogel AI Cream. This foundation works well with my AVENE Hydrance Moisturizer. I can even use this alone with the need of a moisturizer or primer. 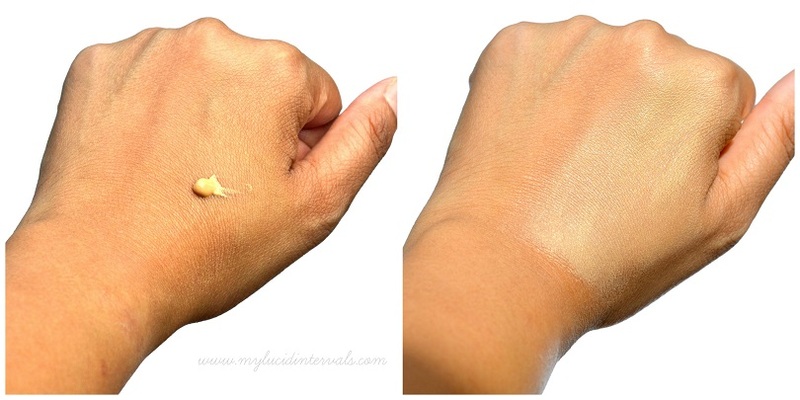 Here is a swatch of this foundation at the back of my hand. 2. This evens out my skin tone very well. Please refer to the before and after photos below. 3. The consistency is very blendable. 4. It can cover my rashes and even my dark circles. 5. The pump is very useful and makes application very sanitary. 6. This foundation offers a wide selection of colors especially to yellow skin/medium toned gals like me. I found my perfect shade in B2. 7. This does not highlight my dry patches or rashes. 10. This did not break me out. 11. This does not look flat or too matte on the skin. It delivers a natural glow and has a satin finish. 12. The coverage is buildable. 13. Perfect to wear in cooler days. 14. It has SPF 24 but has no white cast on flash photography. 1. This wears off easily on humid days. Hence, retouching is a must. 2. It does not work well with thick/heavy moisturizers. 3. Others may find this foundation a bit heavy. This is my before and after shot. Look how troubled and uneven my skin looks. I am having psoriaasis flare ups due to stress. Hence, I have white and red patches on some areas. FYI, I have guttate psoriasis. Overall, I really like this foundation especially this colder season. I love how it blends seamlessly on my skin. Please take note that I have dry, troubled, and super sensitive skin. I'm excited to get my Maybelline Dream Satin! I chose B2 rin. although torn ako between b2 and b3 hehe! Well, this is something worth checking out. Skin looks natural and flawless. Can't wait to get my hands on it. do we really need to let the foundation set it off before applying it on the whole face? I like how it blends! 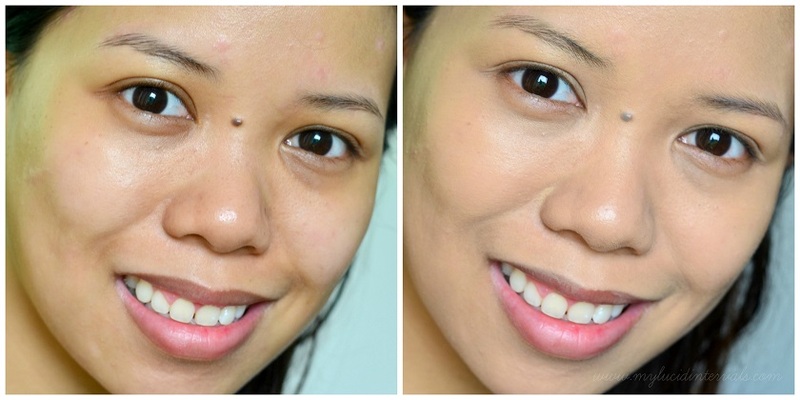 There's definite coverage but your skin still looks fresh after. No breakouts and no white cast ... sound good to me! I hope it works on my skin, i have an oily face kasi. How would you compare dream satin to infallible?